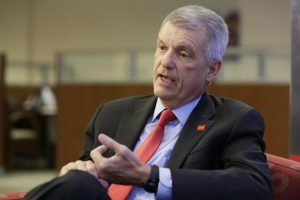 NEW YORK — Wells Fargo’s CEO Tim Sloan stepped down Thursday after a rocky tenure during which the deeply troubled bank dealt with a seemingly unending wave of scandals. Sloan said in a statement he will give up his roles as CEO, president and member of the bank’s board of directors effective immediately. He will retire from the bank completely on June 30. Sloan led the banking giant for less than four years. A longtime insider, Sloan was chosen to replace outgoing CEO John Stumpf, who resigned after Wells Fargo employees were found to have opened millions of bank accounts fraudulently in order to meet unrealistic sales goals. The choice of Sloan did not go over well. He was the bank’s chief financial officer under Stumpf, and while Sloan said he had no knowledge of the bank’s bad practices, he was seen as the wrong choice for a bank that needed outside assistance to help clean up its act. Nevertheless, Sloan staked his legacy at Wells Fargo around his ability to clean up the bank after the scandal. Those are just two examples in what became a game of scandal “whack a mole” at the nation’s second-largest bank. Wells Fargo’s ongoing bad behavior drew the ire of politicians on both sides of the aisle. Federal regulators, who lost patience with Wells Fargo, inflicted harsh punishments. Wells Fargo had to pay a $1 billion fine to the Consumer Financial Protection Bureau and the Office of the Comptroller of the Currency. But more importantly, the Federal Reserve stepped in and handcuffed Wells Fargo’s ability to grow its business until the bank could prove that it had gotten its house in order. Wells Fargo’s board of directors said Thursday it chose Allen Parker, who is currently the bank’s general counsel, as interim CEO and president. In an obvious acknowledgement of the troubles Wells faced when it chose Sloan, an insider, the bank said in a statement that it will be looking for external candidates for the next CEO.